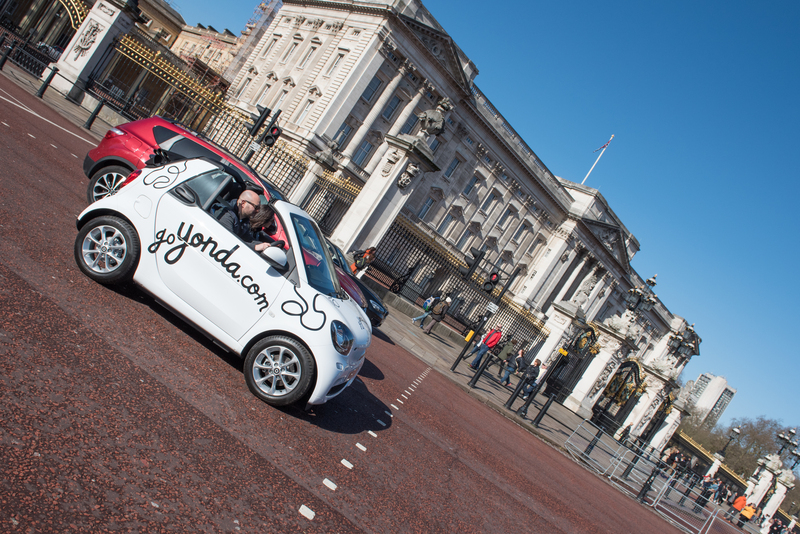 Yonda – with the slogan ‘go Yonda’ – is London’s only self-drive sightseeing experience. 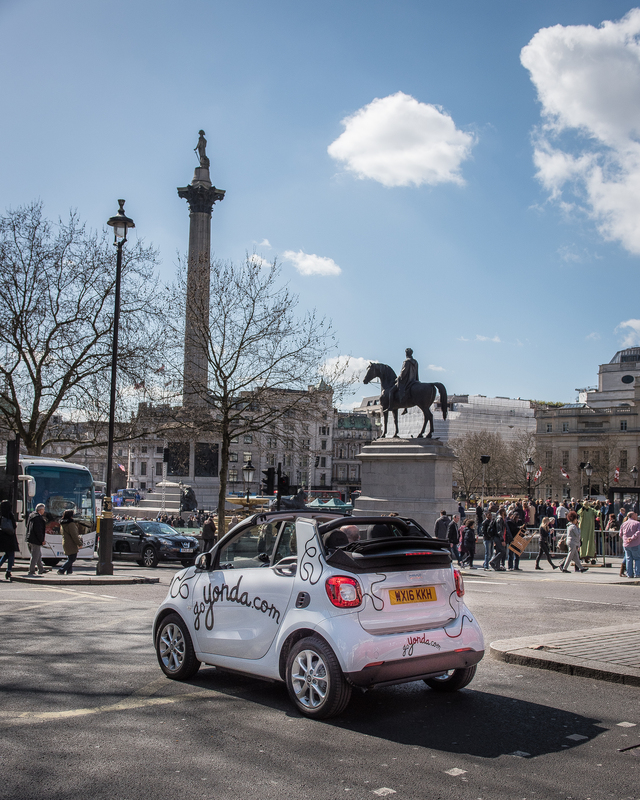 The cars are small Smart cars (two and four-seaters available) installed with an easy-to-follow virtual guide that helps customers navigate London’s streets while seeing the sights. 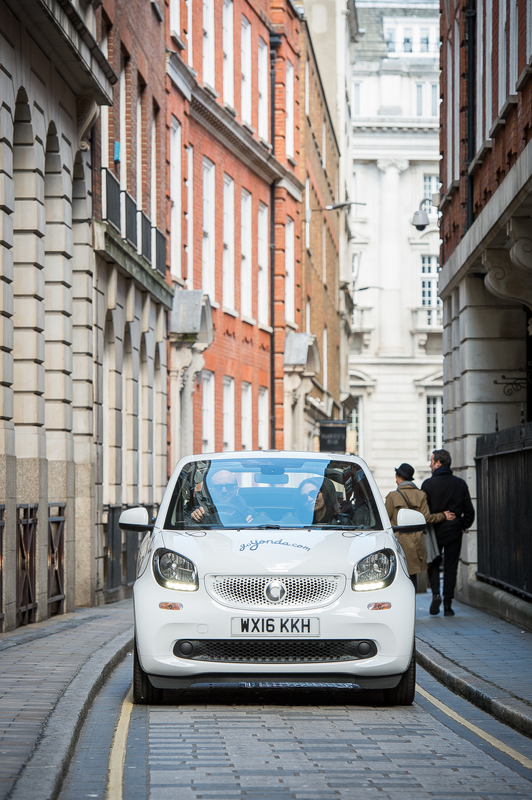 The two-seater Smart cars are convertible (so you can really get closer to London weather!) and the four-seater Smart cars have glass roof windows for the front and back seat passengers. The cars are easy to drive as they have fully automatic gearboxes and staff are on hand to familiarise customers with the car before the tour starts. 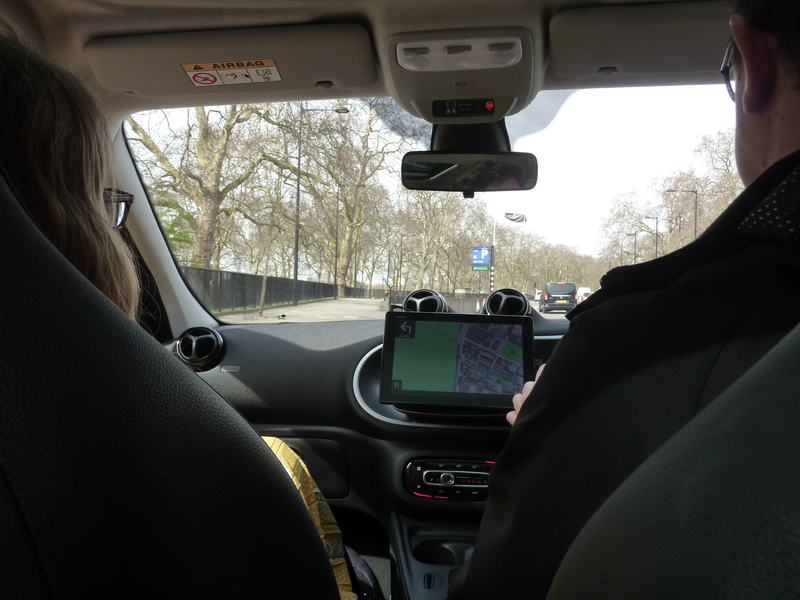 And while you drive the car talks as the bespoke GPS-enabled technology offers a virtual guide. It adapts to how fast you are traveling and adjusts the commentary accordingly. 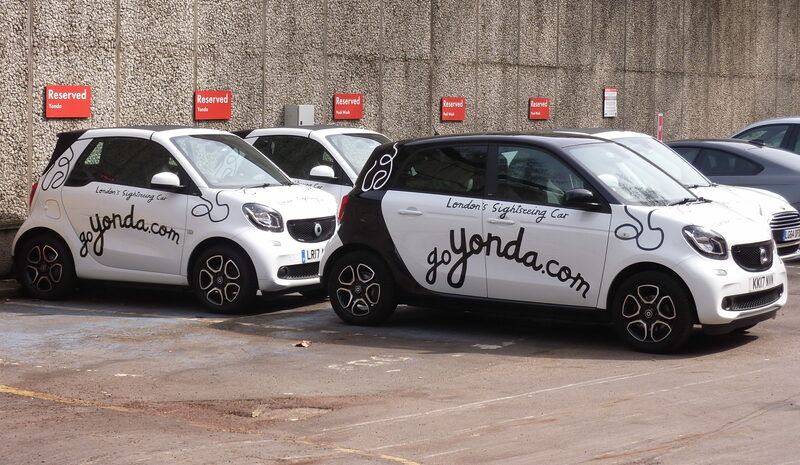 For those who prefer not to drive, a four-seater Smart car with its own Yonda driver is also available. 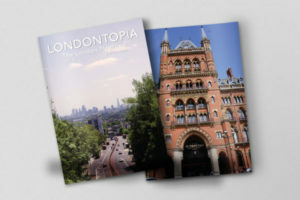 Yonda was launched in May 2017, and the London born co-founder James Kafton spent two years researching and recording the commentary. 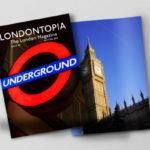 You have 90 minutes to see some iconic sights such as Buckingham Palace and the Houses of Parliament and to get into the back streets that tour buses can’t reach to see even more of London. The commentary is run from a tablet installed in the car. There’s an on-screen map to follow and some driving instructions offered to start. 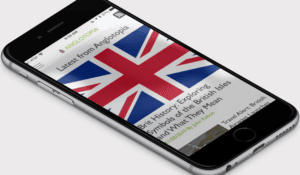 The ‘cockney’ London male voice speaks as the car and aims to be entertaining and informative giving tales of the capital’s history, culture, secrets, and scandals. There are layers of commentary, so each tour is unique. If you are at a location for longer because of traffic lights, etc. there’s more to hear. Yonda is giving away 1,000 tours at the moment (more info below), so I booked quickly so not to miss out. I booked to have a Yonda driver in a four-seater car, so there was room for three passengers. The cars are certainly compact but manageable for 90 minutes. I don’t think I’d like to be in the back seat for a more extended journey. We went out in the car at the front. 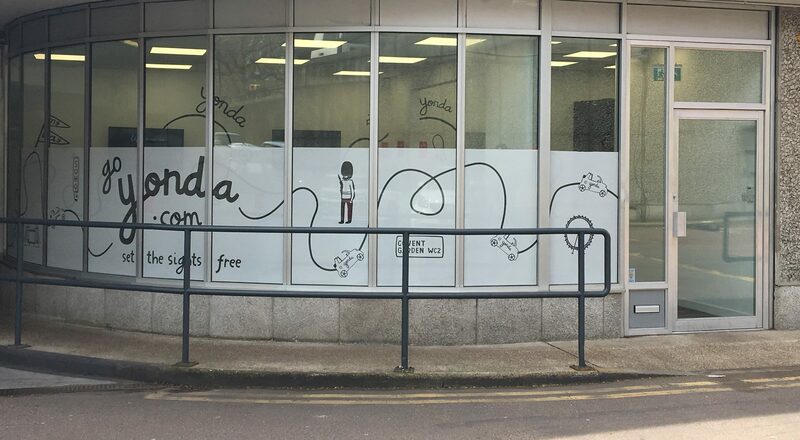 The tour starts and ends at the Yonda central London base. The Yonda HQ is on Park Lane, opposite the Grosvenor House Hotel, on the Hyde Park side of Park Lane, at the entrance to the Q-Park car park. For drivers, it’s a real baptism of fire as you drive up the slope, out of the car park, and join the traffic at three busy lanes. And your first driving task is to get to the other side to cross over into Mayfair. Once there you see the old US Embassy and majestic Georgian architecture around Grosvenor Square. And while guns are generally illegal here, it was interesting to pass Purdey & Sons gunmakers where we heard that a gun takes months to make and costs as much as a Rolls Royce. Do look at the train in the window as it is used in all the themed displays. Don’t worry about getting lost as the map stays on the screen and you can watch the route along the way. The route continues through St James and onto Piccadilly Circus and then into Soho. There’s plenty of London pride, but I don’t think the reference to Cholera in Soho is relevant to visitors to London as it was in the 1850s. The tour doesn’t actually reach Covent Garden piazza, but we did find some cobbles to drive over at Seven Dials! While driving around you soon notice how many roadworks there are in central London. Royal Britannia plays out as you pass through Trafalgar Square. Along St James’s Park, the guide didn’t mention Duck Cottage where the pelicans are fed at 2.30pm every day but did mention the views of the female athletes at the Beach volleyball at Horse Guards Parade during the 2012 London Olympics. The sexist comments did rattle me as my 11-year-old daughter was in the car. 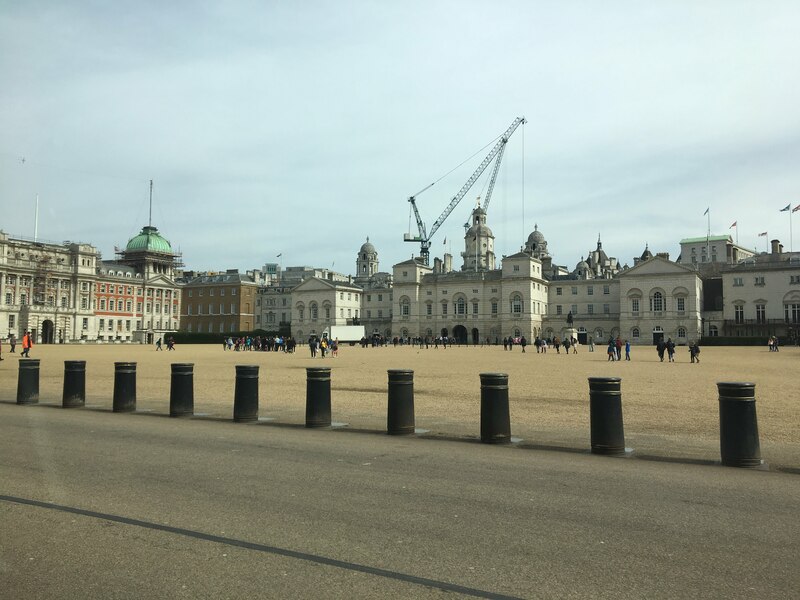 If you pick up the leaflet about the tour at Yonda HQ, it says to “Toot the Horse Guards on Whitehall.” For so many reasons that’s not a good idea but let’s go with the fact the guards are on horses. Anyway, the commentary as we went down Whitehall was interesting as we heard that, since 1902, every Prime Minister has lived at 10 Downing Street. 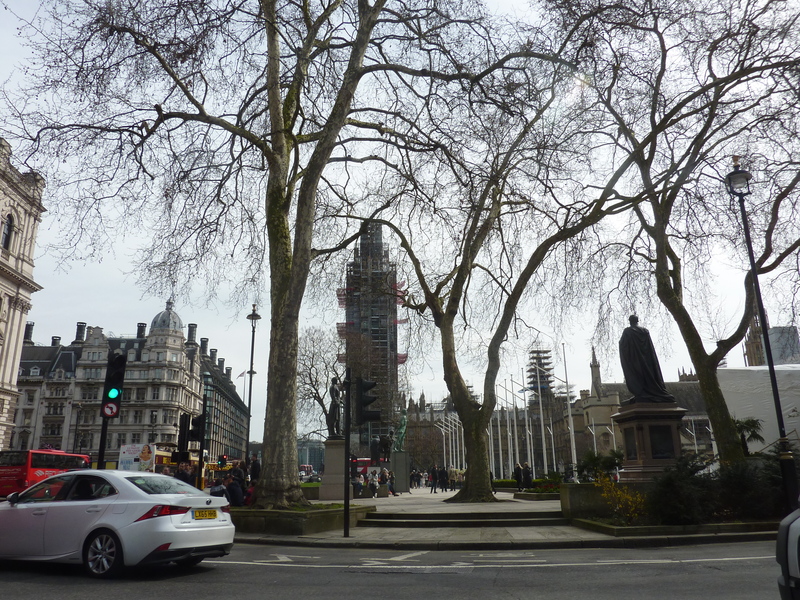 The Elizabeth Tower (Big Ben) at the Houses of Parliament isn’t looking quite so picturesque at the mo with all the scaffolding. The real highlight of the tour was the chance to drive down The Mall. Buses can’t go here, and this gave a great view of Buckingham Palace. 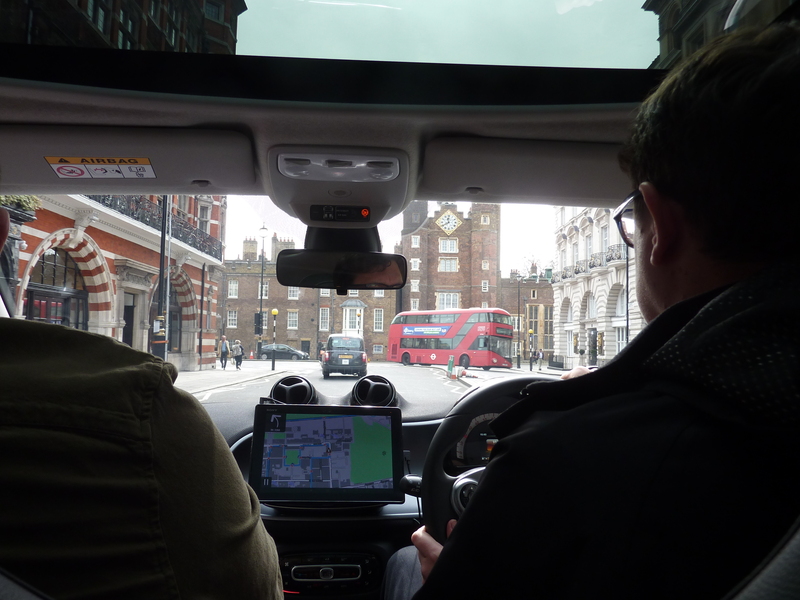 I never drive in central London (I don’t even own a car) so this was a completely new way of seeing the sights. It’s a different view from walking or from the top of a double-decker bus. Having a location-activated virtual guide was interesting, and it was clear a lot of research had gone into the commentary. But it was also clear to me that the researcher was a man of a certain age. The Lord Lucan mystery is from the 1970s and not that relevant unless you lived through the tales at the time. WWII references were included very regularly, and I considered counting the times I heard about Churchill as it was often. The ongoing war inclusions raised xenophobic comments that felt unnecessary. And the misogyny riled me. As well as the beach volleyball comment there was a wolf whistle for Mary Quant’s mini skirt and a discussion about Pippa Middleton’s bottom at William and Kate’s wedding. And while explaining that the name ‘Pall Mall’ comes from a lawn billiards/croquet type game played by Charles II we also heard that “he also enjoyed scoring at no. 79 Pall Mall, the home of his mistress, Nell Gwyn”. That type of casual sexism has no place in a tour guide. I was ashamed my daughter had to hear that and would then consider it was OK for women to be spoken about in that way. That rant aside, I think the commentary needs to include more reasons to look out of the sun-roof as that’s a real bonus too. For example, along Saville Row the guide, quite rightly, talked about men’s tailoring but missed the fact Apple Records was at 3 Saville Row, and The Beatles performed a rooftop concert there in 1969. It was slightly frustrating that the car is always moving so you go past the sights quite quickly (there really aren’t many places where it’s OK to stop a car in central London) and you can’t rewind the commentary if you want to hear something again. The layers of commentary (extra audio when you’re at a location for longer) had some interesting tidbits. We heard that The Queen and Prince Philip have private apartments of about 12 rooms on the first floor of Buckingham Palace, overlooking Green Park. And that Prince Philip calls The Queen “sausage”! Yet while a quick discussion on the north/south London rivalry is fine (north London is better! 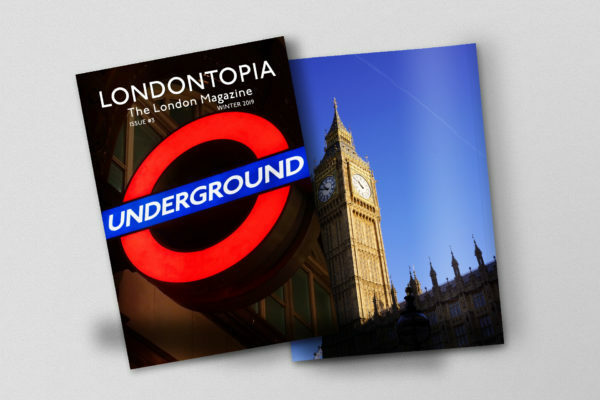 ), the guide does not need to include crime levels as that only raises those concerns for visitors to the capital. Anyway, the 90 minutes do go quickly and you soon find yourself back at the Park Lane car park. 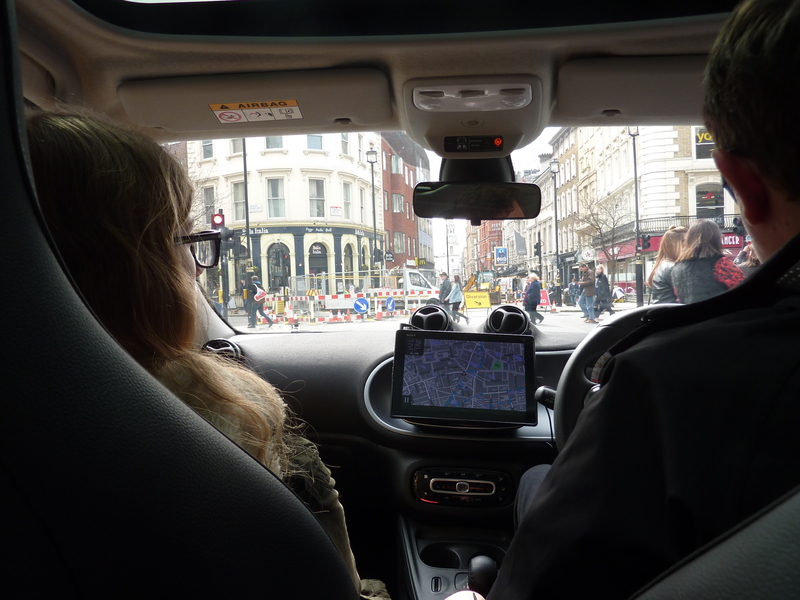 I asked my daughter for her thoughts on the tour, and she enjoyed being driven in central London. In a taxi, you’re sitting in the back, so this was completely new for her. She also thought there was some good insight included in the commentary. Yonda is offering 1,000 free tours to be taken between 2 April and 31 May 2018. 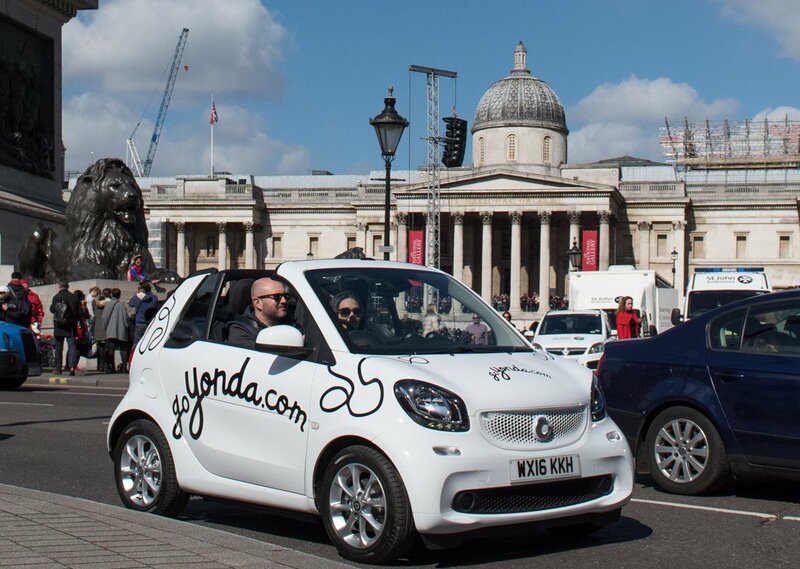 The usual tour price is £60 for a two-seat convertible Yonda car, £95 for a four-seater Yonda car with a fixed panoramic roof and £120 for a four-seater Yonda car with Yonda driver. Free tours are subject to availability. All bookings include fully comprehensive motor insurance. Drivers must be aged 25-75. Only one free booking per customer. Times: Monday to Saturday: 11:30 am to 6 pm. The last tour departs at 6 pm. Children: Must be over the age of four. Booster seats are available for children up to the age of 12 or 135cms tall. Can I trade in a running car?